We held our annual pet show on Tuesday. This is a special time where the children can bring their real pets to school. They just love this. We hold the pet show outside right at the beginning of class. Each child gets a chance to tell us their pets name and what they do to care for their pet. If a child doesn't have a pet they can bring in their favorite stuffed animal to tell us about. After all the pets have been announced, the children may go and visit some of the pets brought to school that day. Each pet and their owner gets a special award that day. After all the festivities the pets get to go home with mom or dad. The whole experience lasts about an half an hour, but it is something the children remember for years--the day they took their pet to school. We also opened Cedarville's Animal Hospital and Grooming Center today. This is a learning center we tried out for the first time last year and the children had a ball with it. Today we had lots of pets being cared for by our caring children. We also finished up our fish bowls by adding some fancy fish stickers. In past years I have also cut the fish bowl out and covered it with plastic wrap to make it look like you were actually looking into a fish bowl. Time was a bit short this year. Our other craft available was a bird puppet. I had found a cute pattern of a parakeet or budgie the children can color and cut. Then the puppet gets folded, we add a tongue depressor, and off it zooms. They think it's the greatest thing. 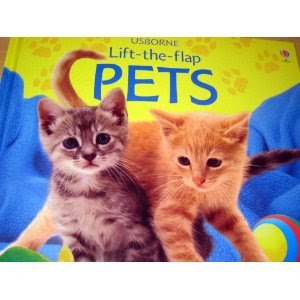 One of my favorite books to read during this unit is "Usborne's Pets," by Sarah Kahn. It is so informative, but at the same time fun. As quickly as our pet unit came, it is already finished. I so wish I had more time to spend on various themes. What a lovely way of celebrating Animals' Day!